Today marks the day that Cops for Kids start their 1000 km, 10-day bike ride from Kelowna, British Columbia, across BC to raise money for kids in need! Cops for Kids is a charity, established in 2001, that works to help children in need, by continually fundraising to raise money for those in need. 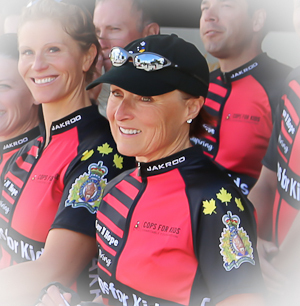 This year there are 28 participating RCMP officers riding in the annual Cops for Kids Ride! Beelineweb.com is proud to have contributed $500 to sponsor Gail Harrison, from our own Lake Country RCMP, to help her meet her goal of raising $15,000. This is Gail’s 12th year participating in the annual Cops for Kids Ride, and she herself is a Nana to 8 grand kids! Please visit Gail’s Raiseathon page to donate today, or check out their main donation page to do your part in helping local kids who need help the most. The fundraiser ends on December 31st, 2017, so there is plenty time to donate!